Manila Water intensifies environmental partnerships with LGUs, NGA | Manila Water Company, Inc. Since its launch in 2012, Toka Toka has fostered and strengthened partnerships with various national government agencies (NGAs), local government units (LGUs), and private companies and organizations to further advance the advocacy. To date, a total of 33 partners have committed into the movement and have developed various projects in support of a shared goal to clean up Metro Manila’s rivers. Recently, Manila Water signed Toka Toka partnership agreements with three stakeholder groups namely the Quezon City LGU, the Department of Interior and Local Government (DILG) Region IV-A Calabarzon, and the municipal government of Binangonan, Rizal Province. 4 September, Quezon City Hall — MWO COO Ding Carpio led the renewal of partnership signing with the local government of QC under the leadership of Mayor Herbert Bautista and Vice Mayor Joy Belmonte. Both parties have committed to hold more lectures on Toka Toka Lingap Sapa and mount clean-up drives in various barangays that will further reinforce their pledges to become waterway champions. Manila Water also vowed to conduct more environmental efforts with the QC government through regular provision of desludging services, tree planting activities, and facility tours for employees of the local government. 5 September, Calamba, Laguna — Toka Toka continues to go beyond borders when Manila Water Philippine Ventures operating unit Laguna Water sealed a partnership with the DILG Region IV-A (CALABARZON) led by Regional Director Manuel Q. Gotis and other LGU Cluster Heads and Environmental Officers. September 7, Binangonan Municipal Hall — Manila Water formalized its Toka Toka partnership for the very first time with the Municipality of Binangonan in Rizal Province. In a historic partnership seal signing, both Manila Water and Binangonan commit to undertake information, education and communication campaigns on the importance of used water management, as well as conduct clean-up drives of waterways. Mayor Cesar Ynares of Binangonan also thanked Manila Water for the latter’s unwavering support in providing clean and potable water for the municipality which has long been dependent on deepwell sources. In response, Carpio also hailed the partnership as a fitting way to celebrate its 10 years of partnership with the local government of Binangonan. Carpio also explained that Manila Water is currently undertaking the Rizal Province Water Supply Improvement Project to serve Binangonan and other adjacent towns of Rizal. 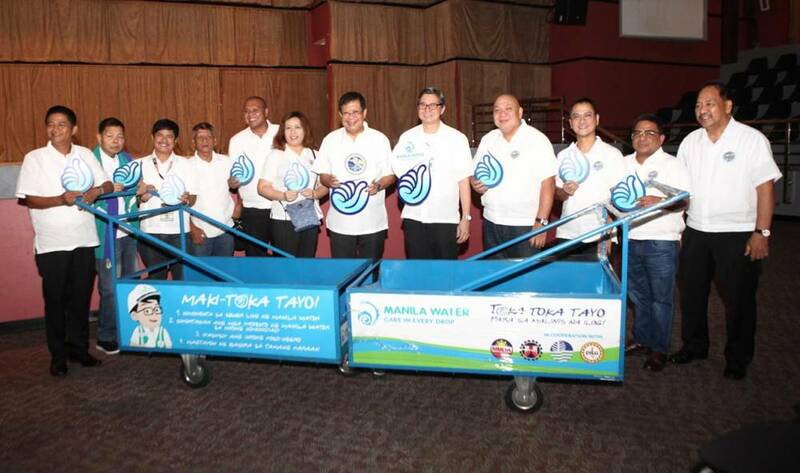 Manila Water turned over donation of push carts to help the Ecological Solid Waste Management Office fulfill their toka of proper solid waste segregation in their municipality.